One of the detriments of shooting a 1911 is the cost of .45ACP ammo. Ever since I fell for the 1911, I have tried to find a way to mitigate the cost of training. A .22 caliber upper sounds like a good path until you shoot one. Then you find almost no recoil, and a tendency for malfunctions. Such a gun is hardly a training stand in for a .45ACP 1911. I began to consider a 9mm gun as a possibility. Last year, I found this Colt 9mm Commander at a gunshow tagged at $675. The seller was a hard bargainer, and I had to settle for $650 to take it home. 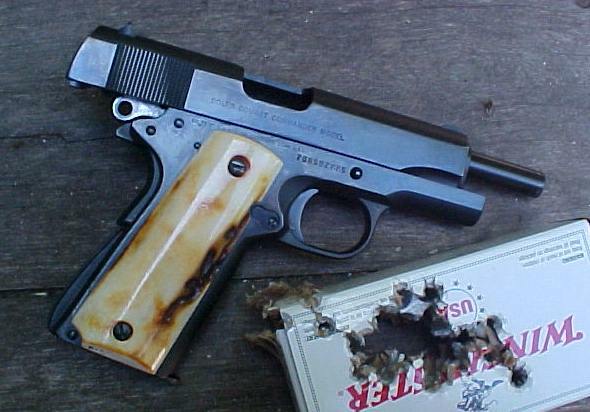 I have always been fascinated by the 9mm 1911s. The allure of cheaper ammo is just to hard to ignore. I figured with every box of 100 rounds I am saving about $10, so after 6500 rounds, this pistol would be free. It's amazing how a determined man can rationalize a new gun! I cleaned and lubed the pistol, then immediately took it to the range to begin saving money. I had one failure to extract in the first 100 rounds. At first, the accuracy was pretty dismal. Then, as I was detailing the pistol, I felt the rear sight move under my thumb. I took it off, center punched the bottom of the slide's dovetail a couple of times, and reinstalled it with red LocTite. The accuracy immediately improved. Fortunately, CDNN had Colt 9mm magazines for $24, so I ordered a couple. The pistol only came with one. After looking at the gorgeous Colt bluing on the Series 70 pistol, I decided it would be a shame to cut the frame for a beavertail grip safety. I decided to keep the little Mil-Spec spur. With the Commander hammer the pistol was not biting me, and I liked the old school look of it. I do ride my thumb on top of the thumb safety, so I installed a single sided Ed Brown thumb safety to match my other 1911s. I had some sambar stag grips in the parts box which I accepted in trade a year prior. I had been waiting for a pistol worthy of these grips, so I installed them with o-rings under the screws to prevent the screws from loosening. I had originally planned to replace the trigger with a black CMC unit, and install a flat Ed Brown mainspring housing. The more I looked at this pistol though, the more I liked it just the way it is. I decided to follow my own advice and just shoot it for 6 months before I did anything else. I tuned the extractor, and cleaned it's tunnel with a .22LR Tornado brush. I used the old ball peen trick to tighten up the bushing in the slide. I polished up the innards of the pistol and stoned the hammer hooks to .020. I then took the pistol back to the range and was extremely pleased with the results. Since I purchased this pistol in January 2005, I have fired approximately 100 rounds a week through it. That totals 6400 rounds over the past 16 months. Thus, this week, after firing the next 100 rounds, I will have a "free" pistol. The pistol has been trouble free since I replaced the worn out extractor. It has required only regular cleaning. I did, in the end, decide to do nothing more to it. It remains one of my favorite guns. My friend's father has a Colt Combat Commander in 9mm. I routinely beg to shoot it. I don't know how Colt did it, but it was made for me to shoot. It's just "one of those guns." I never heard of that "o-ring as a lock-washer" trick before. Sounds neat. Thanks. Beautiful piece. If the 'bluebook' in my head is still correct, I say you got it for a pretty good price. Also I love how you 'rationalizing' works, free guns for all! I've always wanted a 1911 in an 'off' caliber and I think the 9mm is the route I'm going to go for the money saving reason. I recently bought an IMI Baby Eagle in 9mm and quickly realized how much cheaper ammo is. Next project for me is an AR-15 in 9mm, it'll be cheaper than .223 as well. Damn, that is sooo nice!! What's the ball-peen trick on the bushing? The round face of a ball peen hammer can be used to widen the diameter of a 1911 bushing. You hold the rear of the bushing on the hammer face squarely, then smack it onto a wooden table surface. Done correctly, the bushing will expand on the rear end, making for a tighter fit. If you get to much expansion, you will be refitting the bushing. Nice to find your blog. 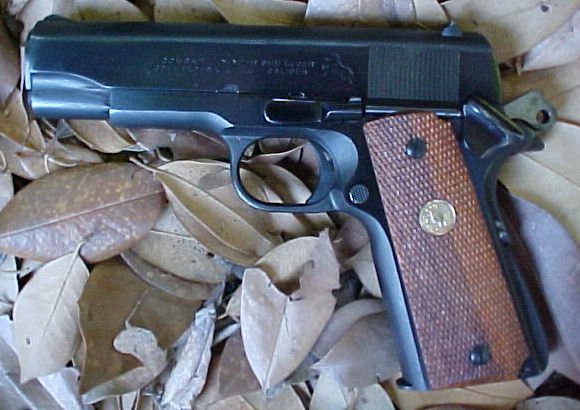 I have 3 Colt Governments in 9mm, a series 70 combat commander, a series 80 cc, and a 1991a. The series 70 has a well worn extractor and doesn't work well. You mentioned repalcing yours. I am having a difficult finding a replacement. Any ideas of reliable vendors? Those grips look really nice. Is this a carry gun also? I notice a little darkening on the hammer (maybe a shadow) that usually shows up on a C&L 1911 carried inside the waistband.. I have always had a "thing" for 9mm Colt Commanders. When I first entered Law Enforcement, the Chief did not like Colt .45's, he inadvertently just banned .45's except for those already carrying them, but still allowed 1911's. Subsequently, my first duty pistol was an all steel Combat Commander in 9mm. I regret ever getting rid of it but it was replaced when a new chief came in and lifted the ban on .45's. A few years ago I found a LW Commander in 9mm, like new without the box at a gun show. I think I paid $650 as well. I took it to Wayne Berquist, a pistolsmith in Fort Myers, FL. S&A magwell, Ed Brown ambi thumb safety, Wilson grip safety, Novak sights and a duty tuned trigger. I am retired now and it is still one of my favorite shooters. Absolutly brilliant mathematics though, you have my compliments!!! Looks like your 9mm Commander is a keeper. I have been thinking about a lightweight 9mm a lot lately (lightweight .45s hurt my hands) and was about have a custom 9mm Commander built, when I tried the Ruger SR9. The Ruger trigger is much closer to a traditional DA than a nice Colt, but size wise, your gun and mine are about the same--course, yours is a LOT prettier! My Ruger SR9 was free too, since I got it on a trade. 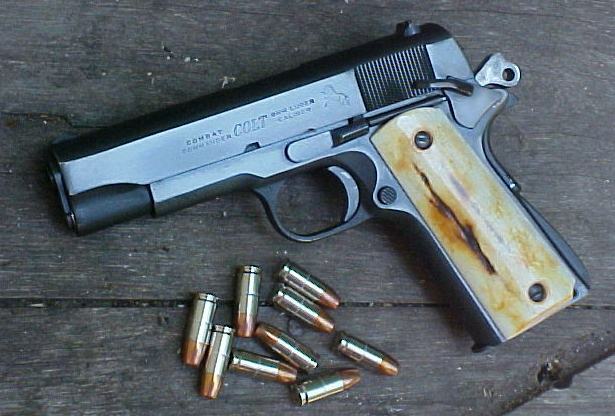 I also have a colt 1911 commander in 9mm satin finish just want to ask if there are rubber grips for it ? would a pachmyer grip for the standard 1911 fit?